Have you ever heard something really weird and thought, "Oh my. That would be my new favorite thing." Sometimes I really, really hope I have the most insane pregnancy cravings just so I can have the most absurd foods for 9 months straight. I almost always love trying new things. Especially when it comes to food. (I added the almost always as a disclaimer, in case any of you weirdos try to get me to try something gross). One time I made blueberry chicken just for the heck of it. Because honestly, all we had in the freezer was chicken, and blueberries. And so I figured, heya. Let's make this work. I still really want to try mint blueberry chicken, but the weird look that my husband gave me when I first said "blueberry chicken" intensifies x10 when I add the "mint". So maybe that experiment will have to be when he's gone for a weekend or something. What this all boils down to is that I saw this recipe for Pumpkin Mac and Cheese, and my mouth started to water. It's like I can taste the possibilities, despite the flavor gamble. We just went over for a double date with some friends, and she had made pumpkin turkey chili, which was also incredibly delicious. The truth is, pumpkin is not just for pumpkin pie. It has so much potential. The original recipe is here, on Spook Fork Bacon's blog. As far as I can tell, it's a blog that I need to get better acquainted with. If that picture doesn't help you to "taste the possibilities" I don't know what will. My pictures are not so fancy -- I'm definitely not a food blogger. I don't even know what kind of blogger I am! 1. Place milk, pumpkin puree, cinnamon, nutmeg, and cloves in a medium saucepan and stir together. Simmer for 15 to 20 minutes. 2. Fill a large pot with water and bring to a boil. Once the water comes to a boil add a generous amount of salt (2½ – 3 tablespoons) and then the pasta. 3. Boil pasta for 10 to 12 minutes or until al dente, stirring occasionally. Drain pasta and set aside. 4. Melt butter over medium heat in a medium saucepan. Sprinkle flour over melted butter and whisk together. Allow mixture to cook for 2 to 3 minutes. Stir in thyme. 5. Whisk pumpkin-milk mixture into flour mixture and continue to whisk until fully incorporated. Allow mixture to simmer until thick enough to coat the back of a wooden spoon, 3 to 4 minutes. 6. Place shredded cheese into a mixing bowl and toss together with lemon (lime) juice. 7. Stir cheese into the béchamel sauce and stir until cheese just melts. Season with salt and pepper. Reduce heat to low and gently stir pasta into the sauce, ½ cup at a time until all of the pasta has been added and is fully coasted in sauce. Adjust seasonings and serve immediately. 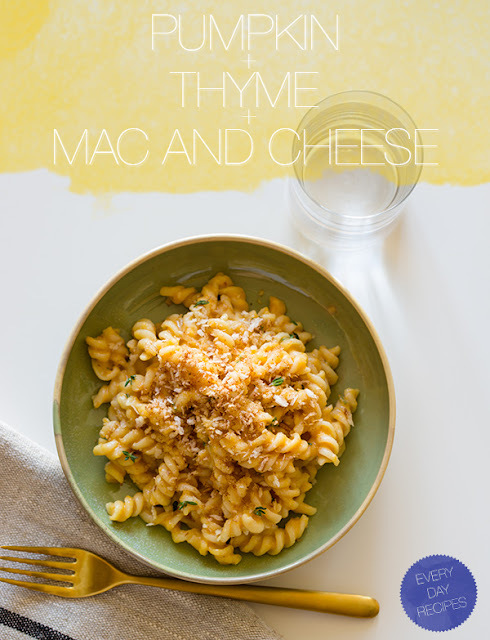 I topped ours with the buttered bread crumbs, and extra grated cheese for good measure! 1. Do not use all the thyme. The flavor was plentiful as it was. I would add 3/4 to 1 tablespoon, and then sprinkle more on top if you feel like it needs a bit more. It's always better to have too little than too much! It's an easier fix. 2. Grate all of your cheese ahead of time, before you start cooking the sauce. If you're like me, you get to the cheese portion, and frantically start grating as everything begins to boil over. To make cooking a breeze, grate first the cheese. New motto. 3. Serve it with a side salad or vegetables or something. It's very, very rich and filling, so I would start with a small bowl and a side and save the rest for leftovers! I hope you try this, because it's a new favorite of both of us. We decided last night that it would be a Fall tradition! And we have 3 lunches worth of leftovers! So I think I'll go have mine now, because my mouth is watering.